Are You Feeding Your Dog The Highest Quality Dry Dog Food? →Are You Feeding Your Dog The Highest Quality Dry Dog Food? If you believe that your dog deserves only the best nutrition that it craves, then you should really start giving her the highest quality dry dog food. I really have to emphasize ‘highest-quality’ here since there are plenty of products that are of mediocre quality. 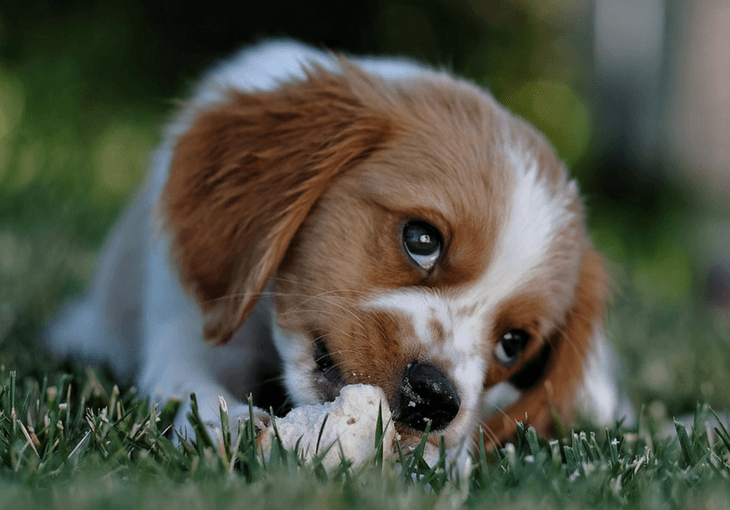 By getting ONLY high quality dry dog food, you are ensuring the following five amazing benefits that this type of canine nutrition can provide. 1. It can help promote optimum dental and oral health for your pooch. There are those who do not honestly believe that dry kibble can help improve the dental and oral health of dogs. They say that it is like saying a dentist will want you to eat crackers more often to help you clean your teeth. Obviously, they are not really aware of the fact that humans and dogs are different when it comes to oral and dental care. We can brush and floss our teeth as well as gargle with mouth rinse. DOGS cannot. According to PetMD, studies show that dogs that were given only dry dog food in the 1930’s, 1940’s and 1950’s, generally had better dental health with fewer incidences of periodontal disease than those that were fed wet dog food. This was confirmed in a 1996 study which also added the value of other types of dry chewing dog activities. A more recent study said that the larger the size​ of the dry kibble the better it is in the removal of dental tartar. I don’t know about you, but unless you can teach your dog to brush its teeth I’d better stick to giving it the highest quality dry dog food. 2. Affords some degree of versatility in feeding your pooch. What many dog owners don’t realize is that you can actually enhance the flavors of the dry kibble that you give to your pet. This is especially beneficial if you have a sick pooch or one that has clearly lost its dentition where soft diet is generally recommended. You can moisten your dog’s kibbles with unseasoned and unsalted chicken or beef broth to help provide for an instant soft diet. 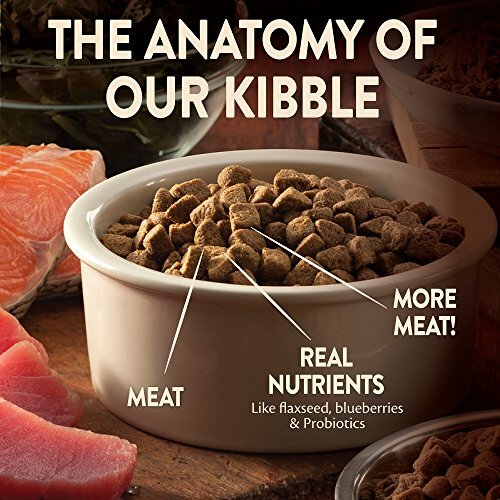 The natural flavors of chicken or even beef will be infused into the dry kibbles. Not only are you providing your pet a really soft, easily digestible diet you are also giving it added nutrients from the chicken or beef infused broth. Of course, you’re not only limited to adding broth as other healthy and nutritious liquids can be added too. 3. Dry dog food will not spoil easily. One of the most obvious benefits of giving your pooch dry dog food is the relatively long shelf life of the product even when it has been opened. Since this type of canine food has already been dehydrated, the chance of spoilage is close to impossible; unless of course, you expose it to moisture which can hasten the speed of spoilage. You can give your pet dry kibble in the morning and it should last the whole day. 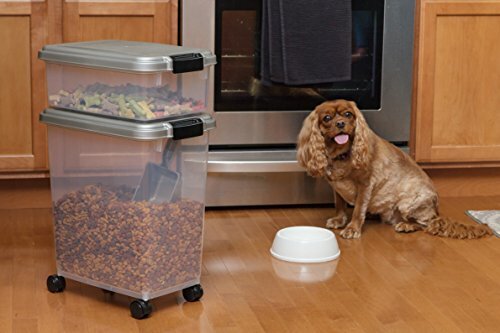 In many cases, pet owners have been known to leave their dogs for for the day with a pet food automatic feeder gadget to help keep their pets fed when their human masters are not around. 4. It is very economical. A bag of dry kibble can last through several days of feeding. On the other hand, a can of wet dog food should be consumed within the day if NOT refrigerated. On a per package cost, dry kibble would seem more expensive. The highest quality dry dog food can cost anywhere between $30 and $50 for a 30-pound bag. On the other hand, a dozen 13-ounce cans of wet dog food will typically cost you between $15 and $25. This means you will need about 40 dozen cans of dog food to match the 30 pound bag. You’re essentially looking at a single-serve can of wet dog food, meaning you’ll have to buy several cans to meet the nutritional requirements for your pooch. 5. It is very easy to store. It goes without saying that dry kibble is very easy to store. You don’t need a refrigerator or any special equipment to keep it fresh. As long as you seal it in its packaging or even keep it inside a container with a lid, then you should be fine. About the Author: Jenny Spiers is mum of 3 and is a devoted pet lover. She is head editor of https://MyPetNeedsThat.com - a passion project run by her best friend for all things animal related and aims to help educate the world on becoming better pet owners! Tell us in the comments below, are you feeding your dog the highest quality dry dog food? Should You Be Feeding Your Dog The Raw Food Diet?